The Lutvaks went to sea looking for adventure, and they found it. Three years and one tropical storm later, they're a different family. It's 7:30 on a Tuesday morning in June, and the crew of Rafiki is just getting going. Cindi Lutvak, 41, is perched on the top step of the aft cabin ladder, following the local weather report on a small VHF radio bracketed below the hatch. She is barefoot, wearing a swimsuit and nylon shorts. Months of tropical sun have raised a sea of freckles across her broad arms and shoulders, turned her skin a deep bronze, and added a glaze of blond to her brown hair. Cindi's husband, Larry, 43, is just above her in the open cockpit, his feet propped against a bright blue cushion, nursing a mug of coffee as he makes his way through a thick history of World War II. A roof of blue canvas shields him from the already searing Bahamas sun. He wears swim trunks, a T-shirt, and sunglasses and sports a child's braiding of a purple lanyard on his left ankle. Searching for friends on the local hailing frequency, Cindi turns up LuAnn and Doug Grant on Whisper. They haven't run across the couple in months, and they eagerly share locations and plans for the day and agree to meet up in a few hours not far from Marsh Harbour, Abaco, in the Bahamas, where Rafiki has been anchored overnight. Voices drift up, a sign that the kids are rousing themselves, and Larry descends the ladder into the main cabin to supervise breakfast. Decorated with children's drawings and tropical shells, sea biscuits and sand dollars, the main cabin is the center of life on Rafiki. At the bottom of the ladder, on the port side, is the compact galley, with its playhouse-sized counter, stove, and double sink. Underneath the counter is the refrigerator. A smaller counter to the side opens to reveal a narrow, chest-style freezer. Larry has already powered up the diesel generator for its morning run - cooling the refrigerator and freezer, making fresh water, and charging the batteries. When the engine-room door is open, it is deafening. Now, with the door closed, it's a steady rumble. Sarah emerges first, dressed in a tank top and shorts. She is 9 years old and slim like her father, with her mother's strong shoulders and straight brown hair pulled back in a ponytail. She climbs onto one of the cabin's cushioned benches and buries herself in a well-worn copy of Harry Potter and the Chamber of Secrets. Evan's chatter begins before his body appears, soaring from the V-berth - the triangular bed he and Sarah share in the bow of the boat - to the floor of the main cabin. At 7, he is all action, muscular and exuberant, with close-cropped brown hair that curls blond at his neck, a pink freckled nose, and engaging blue eyes. Dressed in a bathing suit, he bounds into the galley to check on the breakfast preparations, then bounces back to hover over a sand-filled plastic tub crawling with hermit crabs. He cautiously picks up each and examines its underside. After breakfast, Sarah and Evan are sent to straighten up their berth. A few weeks ago, the next order of business would have been several hours of home school in the main cabin, but summer vacation is now officially underway, the "graduation" ceremony completed, the homemade certificates awarded. So Cindi and Larry head on deck to pull up anchor. At the bow, Larry unties the snubber, a length of rope that holds the anchor chain away from the anchor roller while the boat is moored. He switches on the windlass - an electric winch - and gives Cindi the signal to move the boat forward. A few moments later, the anchor breaks free of the bottom. A solid 60 pounds, it reaches the deck with a clunk. Larry secures it with several ties and signs to Cindi that the job is complete. After threeyears of full-time life on Rafiki, says Larry, "Cindi and I are reading each other's minds." The Lutvaks have sailed their 42-foot ketch some 8,000 miles since the summer of 1997 - down the East Coast from their home port of New Bedford, through the Bahamas to the Dominican Republic, Puerto Rico, the Lesser Antilles, and the coast of Venezuela. It was a huge undertaking for two weekend sailors new to the challenges of the open ocean. Combined with the complications of raising and educating two young children in the confines of a small space, it definitely has tested their limits.But that's what the journey is all about, they say. A serious accident at the start of their second year was just one more challenge and, eventually, one more triumph. "A part for me of coming out on this trip was to get pushed to the edge," says Cindi, a social worker and former Outward Bound instructor who has hiked most of the Appalachian Trail by herself. "I don't feel good about how I handled everything all the time, but I did go to the edge, and I did come through." The Lutvaks' Family Sailing Adventure, as they dubbed it at the outset, was the culmination of years of dreaming, planning, and preparing. Every step was carefully thought out and executed: shaping their fantasy, seeking advice from other sailing families, researching boats, equipment, and supplies, saving money - and investing it aggressively - to finance the trip. They took training courses in everything from weather forecasting to first aid at sea, designed a home schooling program for Sarah and Evan, rented out their house in Wellesley, and sold their cars. Larry is a native of Queens, New York, and holds a master's degree in business from Northeastern University. He began sailing in 1979, shortly after he moved to the Boston area. On a whim, he stopped in one day at Community Boating on the Charles River. "It was a good deal," he remembers. "They teach you how to sail, and you can take out a boat whenever you want." He was immediately hooked, and for the next several years, he spent much of his free time there. Soon after he and Cindi met, in 1984, he bought a 27-foot sloop, which he moored in Buzzards Bay, and the couple spent most of their summer weekends sailing. Larry had been dreaming of sailing the open ocean, maybe crossing the Atlantic alone. The concept of a maritime expedition evolved to include first Cindi, then children. Larry's determination to take the trip intensified after he was laid off by the computer company where he worked as a program manager. "We realized America has it backward, where you're only home for two hours a night," he says. "I didn't want to miss my kids growing up." When Sarah was 3 and Evan 1, they bought Rafiki, named for the eccentric shaman in The Lion King. As preparations began, Cindi and Larry kept friends and family up to date through a newsletter, "The Rafiki Times." Early issues detailed their prog ress as they outfitted both the boat and themselves for full-time family sailing. Larry had been working for his latest employer, Avid Technology in Tewksbury, for only 2 1/2 years, and he kept his plans secret till a few months before their departure. When he finally told his boss, though, he received enthusiastic support and a year's leave of absence. In June 1997, they moved on board. 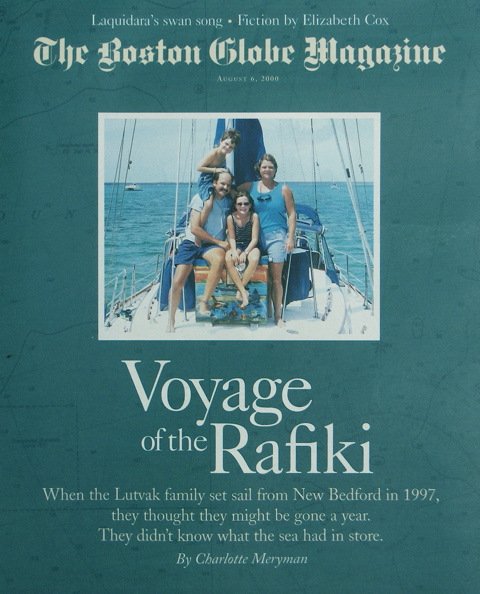 They spent two months headquartered at Pope's Island Marina in New Bedford - the city where Larry and Cindi had married eight years earlier - acclimating themselves to life on Rafiki and saying goodbye to a stream of visitors. In August, they set sail, working their way down the coast, whetting their maritime appetite at Mystic Seaport in Connecticut, stopping to say farewell to family and friends in New York, and exulting for three weeks in the natural wonders of the Chesapeake Bay. They reached Florida in November and, after resting up and reprovisioning, took the next big leap: crossing the Gulf Stream to the Bahamas. The nine-hour sail went smoothly, and they spent the next several months passing south through the Bahama islands, landing ultimately at George Town, on Great Exuma. In those first months, they also were discovering some of the challenges of living together in a small space without the structure and supports of home. There were no baby sitters, no family members to help, no friends next door. Everything was more difficult and time-consuming than it had been at home: cooking, grocery shopping, laundry, showering, phone calls, mail. The equipment breakdowns seemed endless, and the weather controlled their lives more than they had expected. The pressures were greatest on Cindi. They had undertaken this adventure in part to simplify their world. But she soon realized, she says, that "this isn't a simpler life for me. This is far more complicated." While Larry was relishing the freedom and novelty of spending all day with his family and learning the ins and outs of diesel engines, Cindi was handling the same chores that had faced her on land, but in less convenient forms. She also had to adapt to sharing the job. "Now I have Larry around to co-run the family," she observes. "The whole idea of team teaching or team parenting - it's real different in reality when you're team doing it all the time." At home in Wellesley, she would have been able to pick up the phone for a pep talk from a friend. Now she couldn't even step outside for a walk. "There were periods of time where if Larry had said, `Let's go back,' I might have said OK," Cindi admits. "But I knew I was the one having a hard time, and I wanted to get through my thing, because everybody else was OK."
Their two months in George Town helped her get back on track. She took time ashore by herself, some visitors flew in from home, and when their mail finally arrived, it bore a care package from Cindi's best friend in Natick. By the time they headed north, things were on a more even keel. The family was settling into new routines, and Cindi was finding her balance. But now they faced a choice. Their original goal had been at least a year at sea, and they had done that. Was it time to go home? Not now, they decided, not when they finally were hitting their stride. They began planning for another year out, setting their sights on the Caribbean and Venezuela. The first step was a return to Florida, where they spent three months getting work done on the boat, reprovisioning, and enjoying the con ven iences of marina life in the United States - hot showers, washing machines, a choice of restaurants, and working pay phones. In October 1998, with a three-month supply of meat in their freezer and canned goods stashed in every cupboard, they set out again. Six days later, they anchored in a familiar spot off Man-O-War Cay in the Bahamas. The forecast called for a storm the next eve ning, with winds of 20 to 30 knots. They planned to spend the night, then move to a more protected area. Overnight, the winds picked up, and the seas grew rough. They moved the kids from the V-berth, where the tossing is felt most keenly, to the main cabin, where the cushioned benches have safety netting that pulls up along the side. Cindi spent the night in the cockpit, checking the weather and making sure the boat didn't drag its anchor. By dawn, the wind was a steady 30 to 35 knots, gusting to 40, and the waves were rising 4 to 6 feet. They didn't know it, but they were caught in the early throes of Tropical Storm Mitch, which came in faster and more severely than anyone had expected. They decided to eat and then move on. "I know we had breakfast, because the dishes were still in the sink when I came back four days later," Cindi remembers. As they downed their scrambled eggs, a friend radioed that there was plenty of room in the harbor at Hope Town on neighboring Elbow Cay. "We stood and said, `OK, let's get out of here right now.' "
The boat was pitching severely, and as Larry went forward to pull up anchor, he harnessed himself in for safety. He climbed onto the bowsprit, a slatted wooden platform bolted to the tip of the bow, and untied the snubber. The chain wrenched hard against the anchor roller. He signaled to Cindi in the cockpit to move the boat forward as he switched on the windlass. The more the windlass turned, the more the chain seemed to strain. Suddenly, the anchor roller gave way, and the chain slipped starboard onto the bowsprit. It ground against the edge of the boat, breaking through the first stanchion in the bowsprit railing, threatening to topple the entire bowsprit and, with it, the forestay supporting the main mast. The boat was slamming down hard on the waves, and with every crash, the mast wobbled. Sarah, who was down below with Evan, remembers the sounds and sensations: "The boat rocking and rolling, and the wind, the rigging blowing, and the cracking as the stanchions broke." The situation was critical. The anchor had to be pulled up, the chain had to be moved away from the boat, and the windlass was useless. Larry reached over the side, struggling to move the crushing links away from the boat, to get the anchor up at all costs. In a flash, his fingers slipped between the chain and the rub rail. He heard it before he felt it - "a very unsealike noise. Like a squishing, with some cracking mixed in." A photograph taken later shows the rail, splintered and crushed from the force of the pressure. "As soon as I saw my hands," he says, "I knew I would never be the same again." He yelled for Cindi. She climbed forward and tried to lift the chain from his fingers, but the pressure was too great. She scooted back and turned the boat. The chain eased, but Larry didn't have the strength to free himself. By the time she reached him, the chain had tightened again. Cindi raced back to the radio and put out a call for help. She summoned Sarah, then 7, to take over at the handset as she tried again to turn the boat. "I was in the middle of going to the bathroom, I think, when I was told to `GET UP HERE' and handle the radio," recalls Sarah. "I had to say over and over and over, `Vessel in distress, vessel in distress,' which is very tongue-twisting, I must say." After what seemed like an eternity, Larry was able to slide his foot over to the rub rail, wedge the tip of his shoe under the chain as it loosened, and lift it up enough to slide out what was left of his fingers. At the radio, Sarah made contact with the Bahamian Air, Sea and Rescue Association in Hope Town. "We had to give our longitude and latitude, which Mom read to me, and where was our location, describe our boat," says Sarah. "A blue-hulled, double-masted cutter rig, that's all I had to say. The male or female injured, how old (that's a very rude question, by the way), the problem, what caused this, what serious damage." She handled it so well, says Cindi, that later "one of the rescuers in Hope Town admitted that they hesitated to respond to the call. They weren't sure it was real, because it was a child making it, and she was so calm and collected." Five-year-old Evan, hugging his stuffed dog in the cabin below, listened to Sarah and "talked to God." "I knew that something very bad was happening," Evan says, squirming at the memory. "I was scared he might die." Cindi, meanwhile, was "torn between two jobs. I still had to handle the helm and control the boat as best I could, even though we were still anchored. I couldn't bandage his hands or look at his hands or do anything for his fingers except wrap them in a towel, gently. Mostly that was just to keep them from being visible" to the children. Then Cindi saw Larry's color change. He was soaking wet and cold, he says, and, most troubling of all to Cindi, he had stopped making jokes. "She said, `Oh, my God, you're going into shock,' " Larry remembers. Cindi sent one of the kids for a blanket, and then, realizing they would need to evacuate, instructed Evan to get their sneakers and offshore life jackets. A local boat from Man-O-War arrived to help, but the seas were so rough it couldn't get close to them. In desperation, one of the rescuers, Lambert Albury, jumped into the roiling water, scrambled into Rafiki's dinghy, and climbed aboard. He took over the helm and began shifting the boat forward. A second rescuer, Blake Albury, no direct relation to Lambert, scrambled aboard, and Lambert moved to the bow. Blake slammed the boat into high gear, gunning it toward the anchor, which Lambert somehow hauled free. They later concluded the anchor had been stuck on an unmarked underground cable and the bowsprit had been improperly welded. The BASRA boat arrived, and three trained rescuers took over, tending to Larry and transporting the family to a waiting ferry at Man-O-War, while Blake and Lambert Albury moved the boat to a safer mooring. The ferry carried the family to Marsh Harbour, where morphine and beta blockers were injected directly into Larry's fingers to ease the pain. But by now, Mitch was blowing full force, and it was late afternoon before a plane could take them to Florida. At a hospital in West Palm Beach, Larry spent eight hours in surgery. When it was over, the tip of one finger had been reattached. Parts of four other fingers - two on his right hand, two on his left - were gone. He is grateful for what remains, including two intact thumbs. "If the chain had come a little closer, I would have had no fingers," he says. "Or if the boat had lurched, I would have had no hand." Through the entire ordeal, it was Larry's upbeat attitude that kept the family together, says Cindi. "He was calm, brave, and funny." In the weeks that followed, as on that day, Cindi says, "angels ... kept appearing when we needed them." Among them were acquaintances in West Palm Beach who met them at the hospital and housed Cindi, Sarah, and Evan for three days. Fellow sailors offered the use of their condo in nearby Stuart, Florida, during Larry's recovery. A friend of a friend volunteered to keep Rafiki at his dock until it was ready to undergo repairs. The local Montessori school took both children on short notice.Cindi sent a letter describing the accident to their friends on the "Rafiki Times" mailing list, and cards and notes of support poured in. "We pinned these letters up, and they were our daily inspiration," says Cindi. After the bandages came off, Larry worked with a physical therapist three times a week to desensitize and strengthen his damaged fingers. Even so, the pain was often overwhelming, and tapping them in just the wrong way could make him weep. Cindi, as always, was busy keeping everyone together - supporting Larry, taking care of the kids, and making arrangements to retrieve the boat. When her best friend arrived to help a few weeks later, Cindi realized she was more strung out than she had known. "I saw her coming out into the airport off the plane, and I just looked at her, and I burst out in hysterical tears and didn't stop for probably an hour," Cindi says, her eyes filling up at the memory. "It was the first time I could let it all out." Cindi wasn't the only one overwhelmed by feelings. Though initially Sarah seemed fine, after a few months she couldn't tolerate hearing anyone talk about the accident. "She would just sob," says Cindi. "She had a lot of people saying to her, `Oh, I heard you were so brave' and not acknowledging her terror and, gosh, she was just a little girl." "Dec. 1, 1998. It's 10 p.m., everyone is asleep. ... I'm wide awake. Except I'm crying that my fingers are gone. Sarah asked just before I shut out the lights why I had to have the accident. I told her that sometimes bad things happen. We can't let that stop us. ... I told her that sometimes things are hard. Sometimes for no reason. ... All these cliches, that are supposed to make us feel better. Make Sarah feel better. How can she understand? How can I understand?" As the family began to heal, physically and emotionally, they talked about the future. It was soon clear they needed to return to sea, even if only for a short trip back to the Bahamas. In January, Cindi wrote another letter to their friends and family. Rereading it a year and a half later, in the safety of the main cabin on a calm day, tears wet her cheeks and she clasps Sarah's hand tightly. "I can't believe we came out again," she says, her voice a choked whisper. "I mean, it's like, of course, but - my God. If ever there were a better time, an opportunity to turn around. "Even then, I was phrasing it the way we're doing it" now, she says, reading aloud: "Our journey is not completed. We have no commitments on how far we will go or how long we will stay out. What is important to us is that we show our children and ourselves that when bad things happen you brush off and keep going. It's not what happens during life that counts, it is how one handles what is dished out." The letter was accompanied by a full-page drawing of Larry's "new" hands, adorned with arrows showing the names Evan had given to each reconfigured finger: Mr. Gone, Mr. Lemon, Mrs. Lemon, Mrs. Gone, Mr. Pinball. Naming them, wrote Cindi, "added to our humor and gave us a way to talk about specific fingers." On February 16, 1999, they set sail again. Their initial goal was to revisit Man-O-War Cay and thank their rescuers there and in Hope Town. Sarah met the woman at BASRA who had talked her through the accident on the marine radio, and they deepened their friendship with Tito Baldwin, a Dominican Republic native who led the BASRA team and, as Cindi says, "put up with Larry's bad jokes" during the evacuation. From there, says Larry, "every landfall became another choice point." Around June, in the Virgin Islands, they faced a major decision: either turn around now so they would have enough time to get north before hurricane season or get south of the hurricane line and commit to another year at sea. They remembered the cautions of other cruisers, who had warned them about returning to land too soon. "I hadn't finished the Appalachian Trail, and that lingers with me," says Cindi. "I wanted to finish this." They decided to press on. Looking back, they know they made the right decision. The past year and a half has finally given the Lutvaks the trip they originally set out to take - a voyage of exploration rich in special experiences. They toured the tallest waterfall in the world, Angel Falls, in Venezuela, and were welcomed by the governor of a nearby Indian village as the reincarnation of his deceased relatives. They stayed up a whole night on the Puerto Rican island of Culebra, in the Spanish Virgin Islands, watching leatherback turtles lay their eggs. They visited the tiny island of Bequia, in the nation of St. Vincent, and spent the afternoon listening to the stories of a 73-year-old native whaler. In the Leeward Islands, they climbed a dormant volcano on the island of Saba and watched an active one vent ash while anchored off Montserrat. They spent a week touring Dominica and sampling native fruits and spices with newfound Rastafarian friends. Sarah attended a local school on Guana Cay in the Exumas on several different occasions. And Evan spent two days caring for turtles at a rescue operation in the West Indies. They saw six species of shark as well as humpback and sperm whales, dolphins and manatees, octopuses, triggerfish, blowfish, sea urchins, and squid. They also grew as individuals and as a family. Larry taught both kids to play chess. Sarah developed a deft touch with water co ors. Evan learned to read and write. Both children are impressive swimmers, and all four family members learned an enormous amount about the ocean, the stars, the weather, and Caribbean history and culture. But most important, they accomplished their goal. Says Larry: "We did what we said we were going to do, and I think we're very, very proud of that." Now, he says, "We're at the point where the kids could use other kids on a more regular basis. I think we've gone as far as we want to go at this point in our sailing career." In particular, Cindi says, she needs a break from being the only female role model for 9-year-old Sarah, who admits she finds it hard to manage her emotions in such close quarters. She doesn't like fighting with Evan so much, Sarah says, and throwing tantrums on board is particularly challenging. "It's so hard with so little space to go stomping around, and you can't slam your own door, because you don't have your own room." Last December, the Lutvaks began their return voyage from Venezuela. By May, they had reached the Bahamas again, and in late June, they made their longest passage to date, a three-day crossing to Beaufort, North Carolina. They passed the time talking about their years at sea and their "next adventure" - returning home. Cindi and Larry are anxious about the adjustment they will all have to make and about the pressures they will face in the consumer-driven American culture. "We're very proud of the things Sarah doesn't know about," observes Larry. Says Cindi, "We don't want to lose what we've gained out here." They plan to limit after-school activities and closely guard family time. "We joke about how we're going to have to spend the weekend in the kitchen" to re-create the intimacy of Rafiki, she says. Larry is not looking forward to the attention his damaged hands will attract - something he already has experienced in plenty of ports. He knows that, as he interviews for jobs, he will get questions about them and about his plans, and he is already working up a few pithy responses. The truth is, he says, he can do "pretty much everything" he could do before, including holding tiny screws and writing, typing, and helping the kids with their proj ects. "I'm not going to tell Evan I can't dothe origami," Larry says. "I just fold it a little different." He already has been in touch with his old boss at Avid, and he will look at other jobs as well - he thinks the maritime supply industry might be an interesting field. Sarah will enter fourth grade and Evan second at the Hardy School, where Sarah attended kindergarten, around the corner from their Wellesley home. Both are uneasy about the prospect of structured classes every day, and Sarah worries about fitting in: "I don't know if they're going to accept me into their group," she says. She looks forward, however, to regular play dates and friends she won't have to say goodbye to. For her part, Cindi plans to spend the first year helping the rest of the family settle in while she thinks about what she might do next. She worries about feeling lost on land - about feeling as though she belongs nowhere, a sensation other long-term sailors have warned the family about. The change may be hardest on Evan, who, having lived on the boat since age 4, remembers little else. His wardrobe consists almost entirely of bathing suits and T-shirts, and as his feet have grown, his parents have invested not in new sneakers but in bigger flippers. Rafiki also has been his personal jungle gym. He dangles from the open hatches, shimmies up the mast, and flings himself fearlessly from the bowsprit railing. "I'll miss waking up and hearing the sound of the waves and feeling the boat rocking," he says, adopting a tone of mock weeping to mask his very real sadness. "When I go back to the house, I'm going to say, `I'm going to go up top,' and then I'll go upstairs and sit on the roof!" Eventually, say Cindi and Larry, they'll probably move to a waterfront community, but no decision will be made right away. "Cindi and I said no radical changes for the first year," says Larry. "I think just getting back is going to be a big adjustment. Putting the kids back in school, living on land, moving back into the house - those are enough changes." They've also talked about someday living and working overseas for a few years. And Cindi would like to finish the Appalachian Trail, maybe even with Sarah, before she's 50. For now, they expect to dock in New Bedford this month, proud of their accomplishments and at peace with the end of a very long journey. "I've learned that finishing ... wasn't a distance. It wasn't covering something on a chart," says Cindi, tapping her heart with her hand. "It was a feeling in here."